Recipe put forward by Thomas MERIC and Clément REILHS. Poach the eggs for three minutes in vinegary water at a rolling boil and put to one side. Sweat the mushrooms in a hot frying pan with the oil on a brisk flame, adding the Bayonne Ham once the mushrooms have released their water content, then put the pan to one side. Make a vinaigrette dressing with 1/3 de vinegar to 2/3 oil. 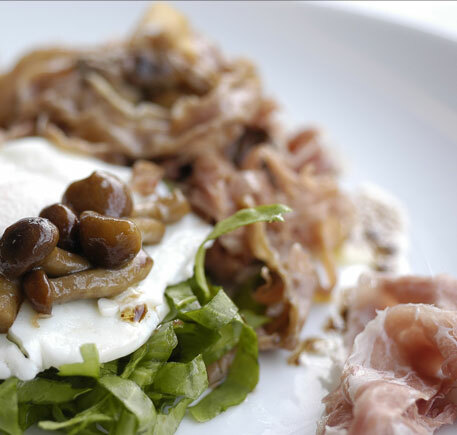 On a hot plate, lay out the mushrooms, the Bayonne Ham, the seasoned salad and top with a poached egg.